Predator isn’t on the 1001 Movies You Must See Before You Die list, and I find this odd. Not write-a-letter-to-the-publishers odd, but noteworthy enough to start a review tangent before I’ve even gotten started. It doesn’t deserve a place for being revolutionary, as it’s far from the first manly men on a mission film (see The Wild Bunch, which has a place, or The Dirty Dozen, which does not, both of which are arguably better films, or at least just as great in their own ways), but Predator might just be the best of the otherwise relatively ho-hum or occasionally laughably dire action men versus threat-of-the-week Americana that the 80s and 90s vomited upon the world of cinema; the kinds of films that made Steven Seagal, Jean Claude Van Damme and Chuck Norris household names, but which very rarely get discussed aside from lists of the best movie deaths via kicking or scenes in which Gary Busey appears in drag. When I say the best, I obviously means aside from Die Hard, because come on, it’s Die Hard, what are we even talking about? 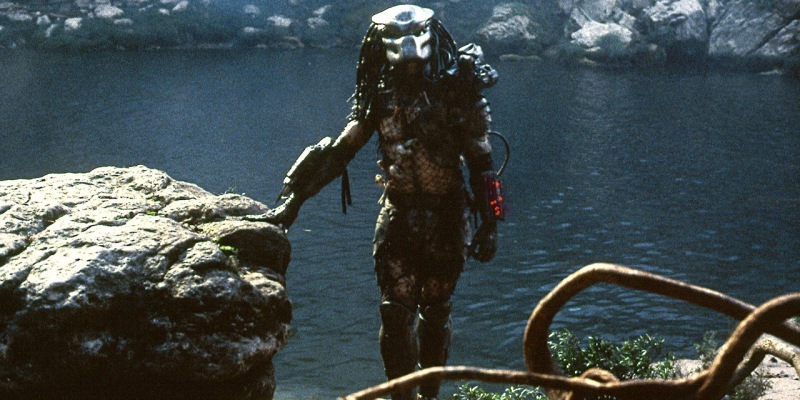 It’s difficult for me to look at Predator today without thinking it’s more than a little silly. 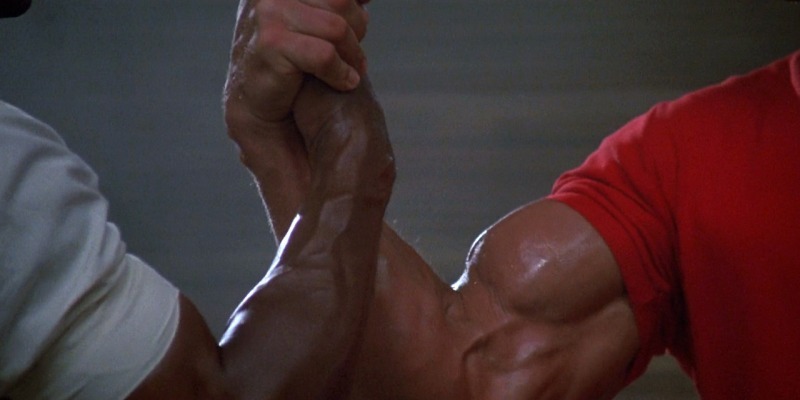 The excessive bravado, the token cheesy Arnie one-liners (“Stick around,” he deadpans, after skewering an enemy in place with the throw of a knife), the almost ludicrous mid-air arm wrestle handshake between Dutch (Schwarzenegger) and Dillon (Carl Weathers), but after raising this insight on the recent Lambcast episode dedicated to the Predator franchise I have been corrected on this issue, primarily by Will from Exploding Helicopter. Yes, the arm wrestle handshake seems like an excuse for a bicep-off between the two muscle-bound behemoths, but it’s also a very efficient way within the scene of establishing the relationship these two have with one another, that of rivalry and one-upmanship, with Dillon’s recent move to a more official role taking a physical toll that puts him in a position of inferiority to his field-based former colleague. The machismo on the display amongst the rest of the squad is also useful in providing character beats that offer just enough detail to make the characters memorable without wasting time with superfluous back story. 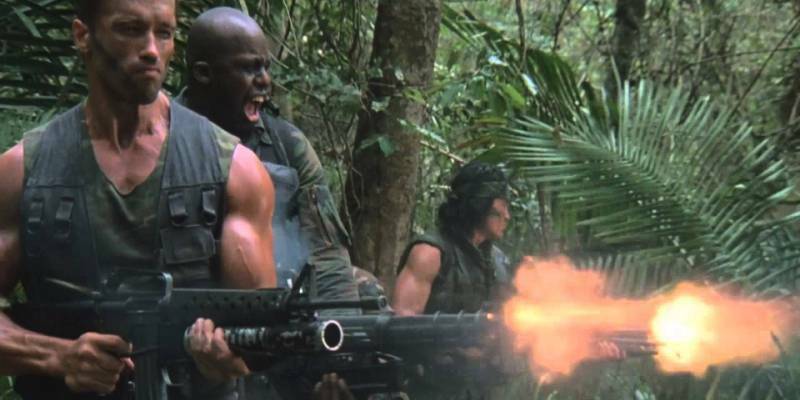 Hence the tobacco-chewing sexual boasts of Blaine (Jesse Ventura), the dead-eyed stare of Mac (Bill Duke), the obscene jokes from Hawkins (Shane Black) and Billy (Sonny Landham) cutting his own chest to face a foe. The only member of the squad I had no recollection of from my previous viewing (and to be honest, I can barely remember anything he did from this time around) is Poncho (Richard Chaves), who unless I missed something has far fewer quirks or idiosyncrasies to distinguish him from the others, so pales in comparison, and also isn’t integral to one of the better scenes, when the crew unleash a barrage of gunfire at an unsuspecting jungle. 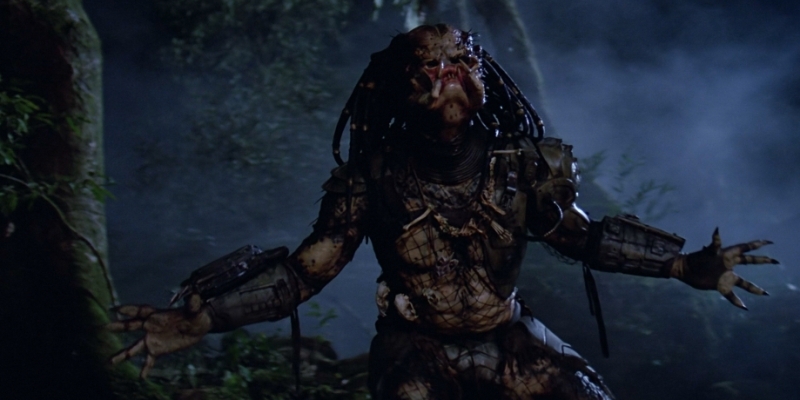 Male bravado aside, the persistent success of Predator is probably due to its simplicity. At heart it’s a film of three segments, which become progressively easier to understand. The first third details the initial mission, with the team attempting to rescue their target from the hostage-takers. After that’s all finished with the real meat of the film begins, with the team finding themselves being hunted by an unseen foe for the middle third as they seek to flee the jungle. The climactic third is a showdown between the surviving characters, and I was shocked by how much of the film it took up, and how rapidly the middle segment was over. Let’s just say that the rate of character deaths is pretty rapid for a while. And that’s the entirety of the film. Team goes into the jungle to fight an enemy. Team gets hunted by something else. Survivors from the team face off against the hunter. Of course there’s slightly more to it than that, but as a core story goes it’s incredibly easy to understand and follow, even with a few curve balls thrown along the way. The main surprise – at least for the team – is the creature hunting them, and the most surprising part is that it’s some kind of alien, and as creature designs go it’s a pretty phenomenal one that has rightly become iconic in the subsequent decades. The look is awesome – shiny metal mask, dreadlocks, shoulder-mounted cannon, wrist-mounted console – and the fact that it’s a real guy in a real suit, really fighting with our heroes makes everything so much more effective than, for example, the more CGI-based scenes from the recent The Predator. Even small elements like the three red dots of its laser sight are simple yet instantly recognisable. The invisibility effects are fine for the time, reminiscent of a mirror ball or magic eye image, although the glowing yellow eyes looked a bit out of place. Once the Predator’s mask comes off and we get a look at the frankly hideous face underneath the creature design and effects crank up even further, with those grotesque tusks and mandibles around a true nightmare of a mouth; it’s nothing short of awesome. 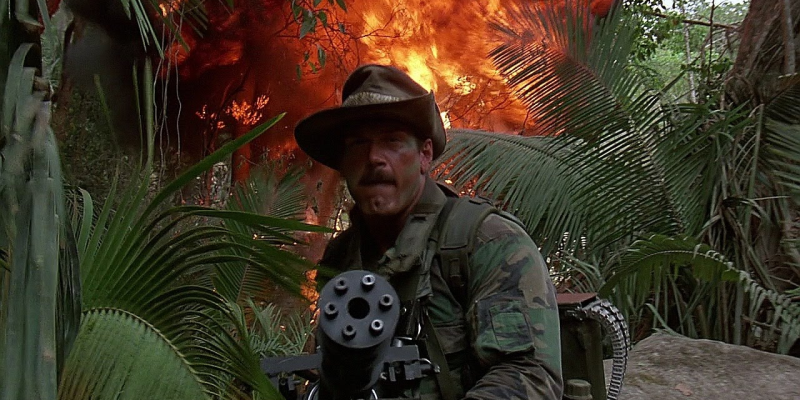 Predator is great. The effects mostly hold up today, the action is intense yet fun, the characters are developed enough without wasting our time, it’s just scary enough to be thrilling, and above all it’s thoroughly entertaining from start to finish. It doesn’t quite earn a perfect score just because it doesn’t have the same degree of meaning to me as it seems to for others, I just think it’s a great, must-see film, and I’m annoyed my wife bailed on it before the Predator even showed up. 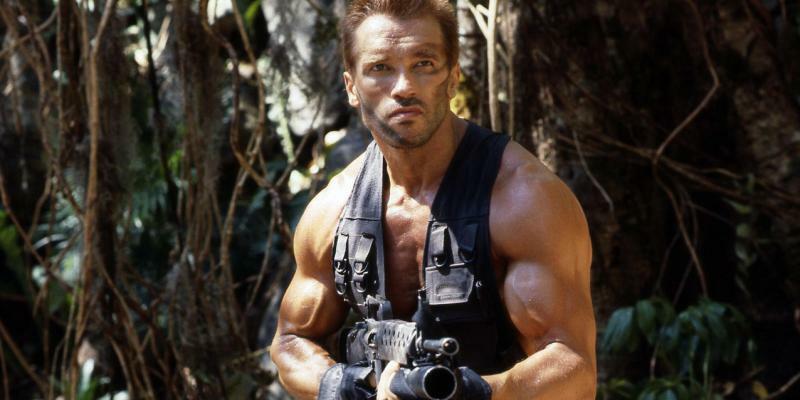 This entry was posted in 09/10, Choose Film, Empire 100, Empire Top 301, Empire Top 500, Matthew Vaughn and tagged Arnold Schwarzenegger, Bill Duke, Carl Weathers, Elpidia Carrillo, Jesse Ventura, John McTiernan, Kevin Peter Hall, Peter Cullen, Predator, R. G. Armstrong, Richard Chaves, Shane Black, Sonny Landham by jaycluitt. Bookmark the permalink. Absolutely love it. I can’t tell you how many times I have watched this flick over the years. I don’t know why it’s been so long since I last saw it, such a lot of fun!